As the recruiter for CEDARS Foster Care, Adrianne Poppe has the privilege of working closely with many families in the community as they begin their fostering journey. She is their teammate, their cheerleader, their coach and their friend. We are thrilled to have her on our team and are pleased to invite you to get to know her. CEDARS: Adrianne, thanks for taking time out of your day! I know you’re busy. Adrianne Poppe: Oh, I’m happy to! I think I have just enough time before my next home visit. CEDARS: With a new foster family? CEDARS: I promise to keep this short! CEDARS: Where did you grow up? AP: I grew up in Grant, Nebraska. It’s a small town of about 1,200 people about 4 hours west of Lincoln! CEDARS: What was it like? AP: Grant is small town living at its finest! Everyone takes pride in the town and the sense of community is so strong there! You honestly can’t even go for a walk without someone rolling down their window and asking if you need a lift! Everyone really looks out for everyone and that is such a blessing! CEDARS: Do you have a favorite childhood memory? AP: Growing up my sister and I would pop in our New Kids on the Block cassette tape and sing and dance in the living room for hours! That was one of our favorite things to do, and we have some pretty hilarious home videos to prove it! In 2008 we were finally able to go see them in concert! That night was a blast, and it felt like we time traveled back to 1989! AP: I always knew that I wanted to have a job where I was helping others. While I was attending the University of Nebraska I was a member of the cheerleading team, and we were asked to help out with the National Adoption Day Celebration. That day was the game changer for me. Up until that point I was pursuing a degree in middle level education; but after I saw all of the children, families and supporters coming together and celebrating their new journey into their forever families, I knew I had to look into another career path. The very next day I changed my major to child, youth and family studies and my advisor suggested looking into a part time job with CEDARS. From the moment I dropped off my application at the front desk, I knew that CEDARS was the right fit for me. I could tell that everyone working there had a true passion for their jobs, and I still see that today. It makes me extremely proud to be a part of such an outstanding organization where everyone truly walks out our mission to help children who have been abused, neglected, and homeless achieve safety, stability and enduring family relationships. I have now been with CEDARS for 7 years and have worked in just about every service area we have! I started out in our Early Childhood Development Centers. I really enjoyed working with those kiddos and I do miss seeing their little faces on a daily basis! For a short time I worked as a family support specialist and then was the assistant program manager for our Community Learning Centers. On the weekends, I pick up shifts every now and then to help out in our emergency shelter and group homes. AP: In April I began my new role as the recruiter for our Foster Care program! It is extremely rewarding to be able meet with families that are interested in opening up their homes and hearts to children in need in our community and help them begin their journey as foster parents. I think I get just as excited as they do! I have to say that I am very proud to be a part of our foster care program. The quality of work and level of support that our foster care team provides to our homes is something that definitely sets us apart. AP: When I am not working at CEDARS, I am usually at Lincoln High School! I coach the dance team and that is definitely something that I really enjoy. Dance has always been a large part of my life, and I am thankful that I have this opportunity to coach and keep doing what I love. The girls on my team keep me youthful, that ‘s for sure! They all work extremely hard and have really grown as a team this year. It’s a great feeling to see them supporting their school and taking pride in their performances weekly! AP: I have many but one that has really made an impact on my job today happened right after I started with our foster care program. It was probably my fifth home visit ever and I went to meet with a family looking to start the process to become foster parents. When I got to the house, I was met at the door by a five-year-old boy. He yelled to his mom saying, “Mom the foster care lady is here.” The mom and dad introduced themselves and their son to me, and then we sat down to talk. While I met with the parents the little boy sat quietly in the kitchen. When it was time for me to leave, he came up and handed me a piece of paper and on the paper he had drawn a picture of a present. His mom asked him why he was giving me a gift and he enthusiastically said, “Because she is helping us give another child a safe place to stay!” It was clear that his parents had sat down and talked to him about their decision to become foster parents, and he truly understood the joy that comes out of helping others! I keep the picture up in my office to remind me that no matter how big or small the gesture, there is so much good that comes out of giving gifts to others whether it be opening your homes, donating your time or money or a simple smile! CEDARS: Adrianne, I hear you like memes. Got a favorite? AP: (laughing) Of course I do! 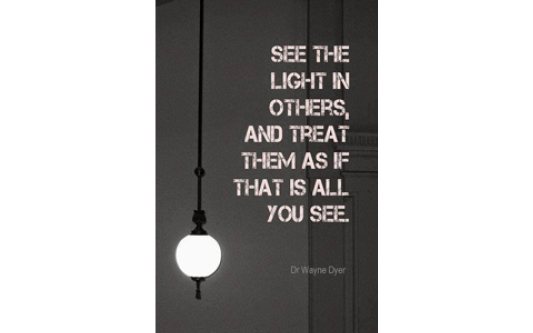 It’s a black and white photograph of a hanging lamp with a quote by Dr. Wayne Dyer: “See the light in others, and treat them as if that is all you see.” I also love funny ones!